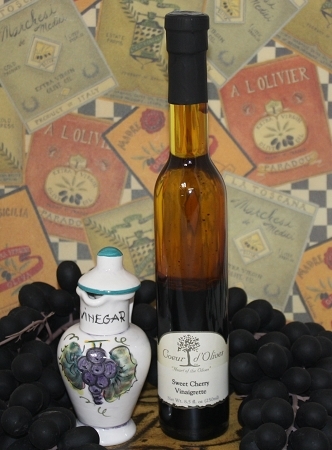 A delicious blending of Coeur d’Olives™ Tuscany Extra Virgin Olive Oil with Coeur d’Olives™ Aged Tangerine Balsamic and Coeur d’Olives™ Aged Black Cherry Balsamic. The olive oil gives a nice, buttery base and the balsamic blend adds a sweet, fruity taste. It goes very well on dishes such as pasta, chicken, salmon, tomato and spinach salad, and as a marinade. Try it as a marinade on skirt steak or lamb.